Royal Mail has launched the annual Dog Awareness Week (30 June-4 July) to raise understanding of the issue of dog attacks on postmen and women - and members of the public. On average around nine postmen and women a day are attacked by dogs across the UK with over 3,300 attacks taking place from April 2013 to April 2014, an 8 per cent increase on the previous year. The number of attacks peaks during the school holidays. Royal Mail wants to encourage responsible dog ownership and to appeal to dog owners to keep animals under control when the postman calls. 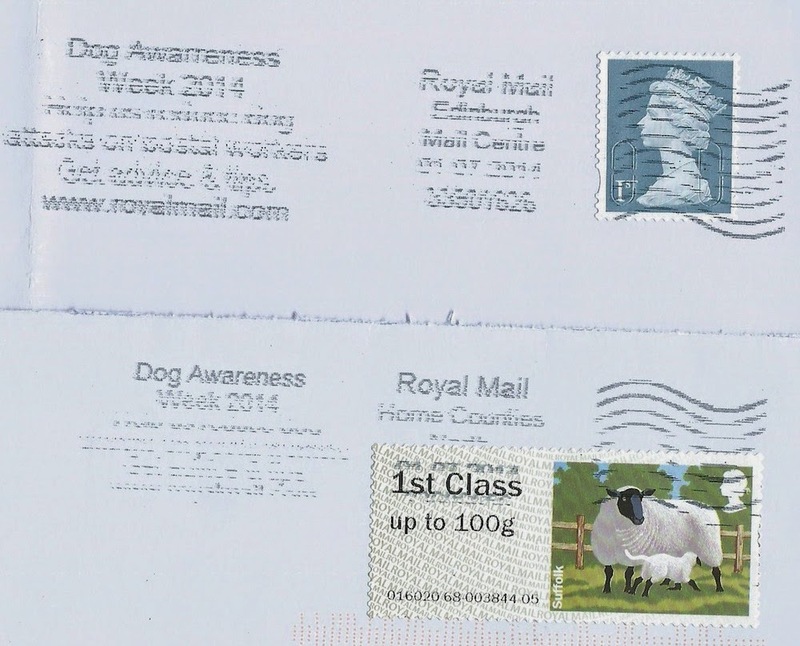 As they said at our delivery office, it would be a good idea to have a Dog Awareness sticker on ALL mail, rather than just the stamped mail, given that such a large percentage of the daily mailbag is either franked or has a postage-paid impression. Postmark collectors should look out for the corrected spelling version of this postmark, if, that is, RM is awarre of the error. They have been told, via twitter and were already aware. And we have evidence that HCNorth was changed yesterday, see additional pic above. My regular postie has been bitten by a dog on the delivery round. He also is a dog owner. Dog awareness week, I want a Slug awareness month!. 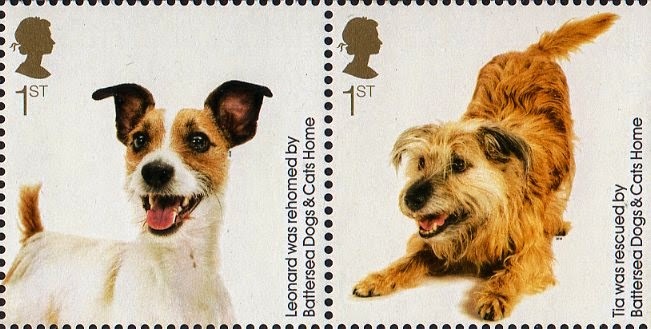 May I suggest that rather than the 2 friendly-looking mutts featured at the head of this piece, a more appropriate illustration might be the Hound of The Baskervilles stamp issued on 13 May 1997. I doubt that a postman would be prepared to even consider delivering a letter with that stuck on it. I did consider others from the Battersea series, but chose the two cuteist looking. In fact the little ones are the ones that nip the ankles, and jump up and bite. A colleague was lifted from the ground bodliy by a dog-owner with his large dog still hanging on to her ankle. He probably kicked the dog away before it was 'safe' to restore the young lady to terra firma. On the other hand, the dog that sleeps on the doormat below the letterbox could be rendered senseless by a heavy mail order catalogue, as my wife - temporarily worried - can affirm!